Morning Free. Later transfer to the Airport to connect flight IC 471 dep at 13:10 hrs arrive Udaipur at 15:15 hrs. On arrival transfer to the Hotel. Rest of the day free for own activities. Overnight stay at Hotel. Morning drive to Jodhpur which is 259 kms. & approx. 06 hrs journey. En-route visit centuries old Jain Temples in Ranakpur. On arrival transfer to hotel. Rest of the time is free to relax. Overnight at hotel. Morning free. Later transfer to the Airport to connect flight IT 2316 12:30 hrs arrive Jaipur at 13:30 hrs. On arrival transfer to the Hotel. Overnight stay at hotel. Evening you may explore the colourful markets of Jaipur by own. Overnight stay at Hotel. Morning drive to Agra (232 kms / 5 hrs). Enroute visit Fatehpur Sikri the deserted, red sandstone city, Emperor Akbar built that as his capital and palace in the late 16th century is an exhilarating experience. Upon arrival transfer to the Hotel. Overnight stay at Hotel. 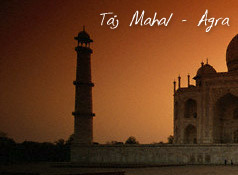 Morning visit world famous "Taj Mahal" the monument of love immortalized in marble. 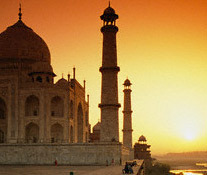 It was built by Emperor Shah Jahan in the memory of his Queen Mumtaj. Agra Fort dominated by red sandstone construction & houses the beautiful Pearl Mosque and other noteworthy structures. Afternoon drive to Delhi (203 kms / 4 hrs). On arrival transfer to the International Airport to connect flight for onward destination.